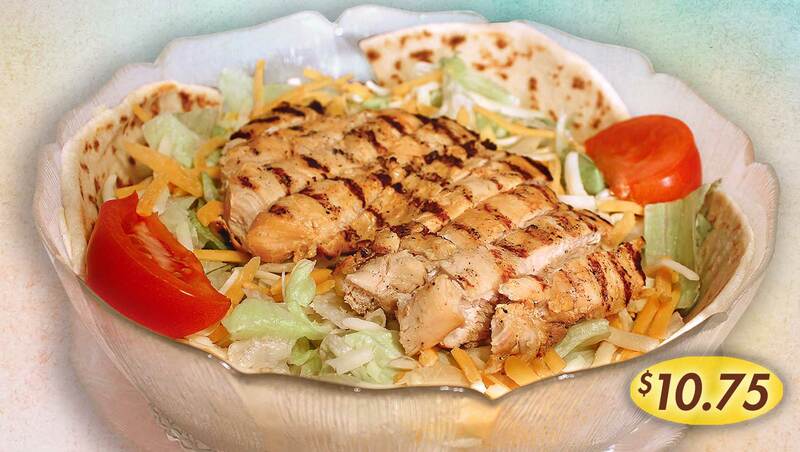 A broiled chicken breast, julienne sliced, over a bed of lettuce, cheddar jack cheese and tomato… with grilled pita. A great salad! Want your chicken buffalo style, just ask! 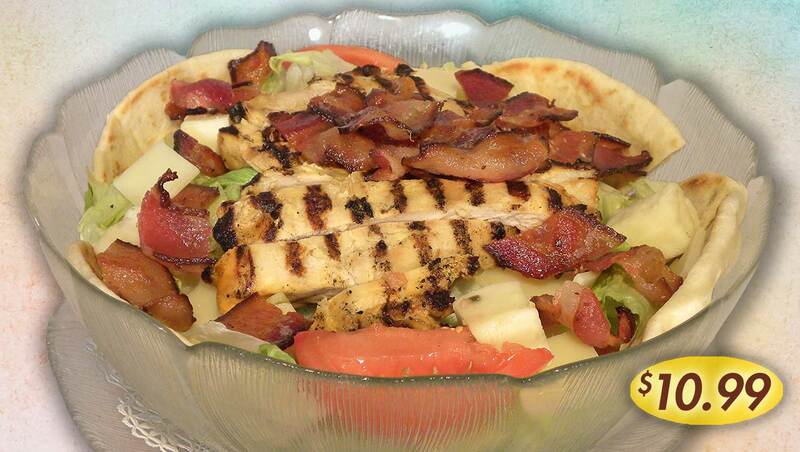 Broiled chicken breast julienne sliced on a bed of lettuce, tomatoes, bacon bits, Swiss and pepper jack cheese… with grilled pita. 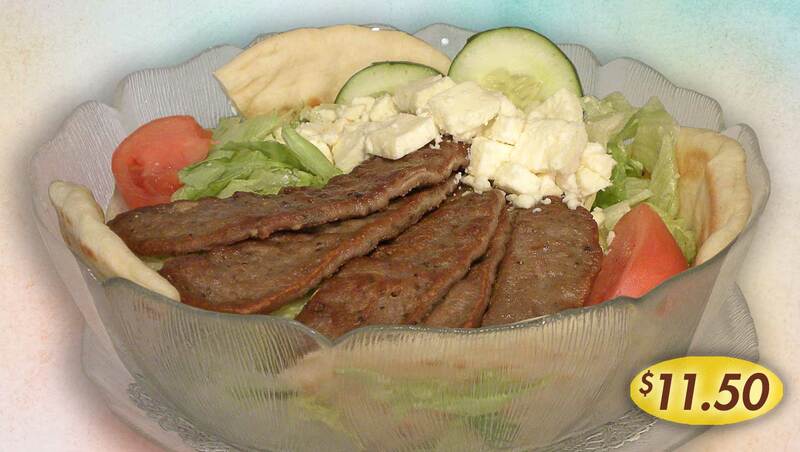 Slow grilled Gyro meat (lamb & beef) with feta cheese, lettuce, tomato, cucumbers & our house tzatziki dressing (or a dressing of your choice). 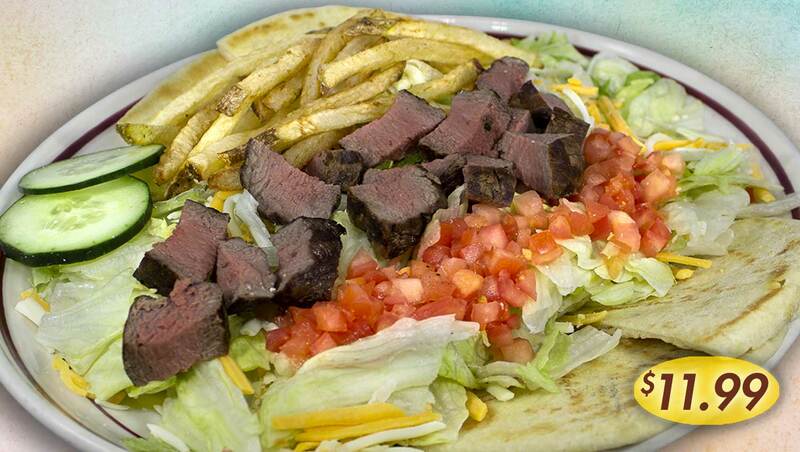 Choice filet over a bed of lettuce, tomatoes, cucumbers, cheddar jack cheese, a few of our great fries and grilled pita… served medium rare unless otherwise requested. 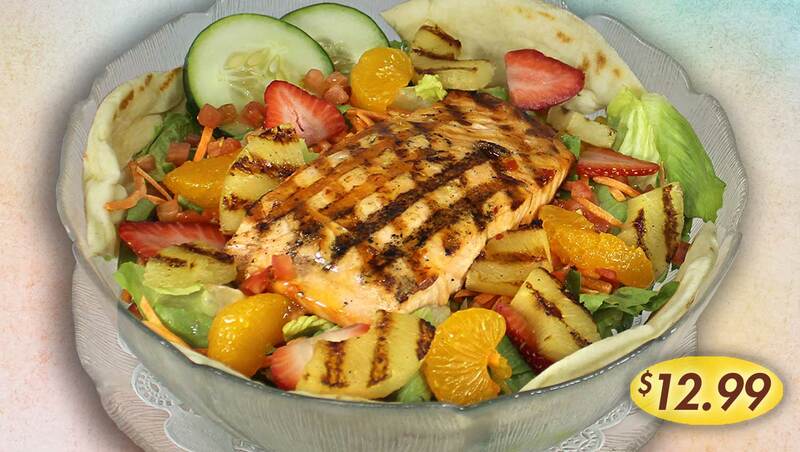 Broiled salmon over baby spinach with seasonal fruit, carrots, cucumbers, a touch of diced tomatoes & grilled pita. 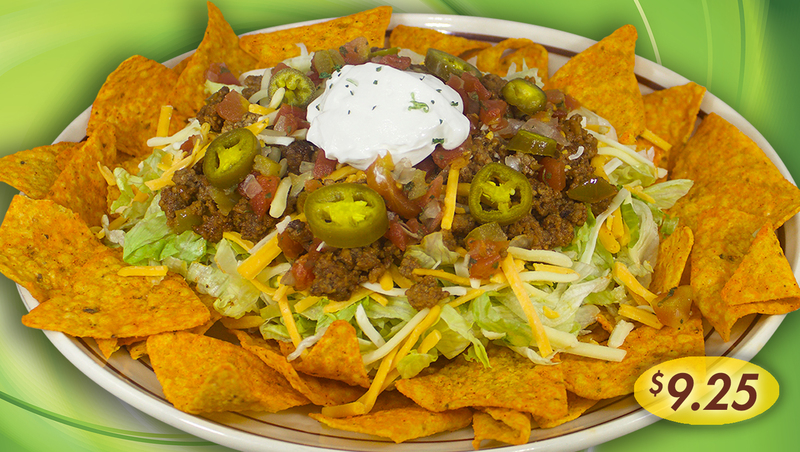 A layer of cheddar flavored taco chips, seasoned taco beef, shredded lettuce, cheddar jack cheese, pico de gallo, sour cream and a few jalapeños. 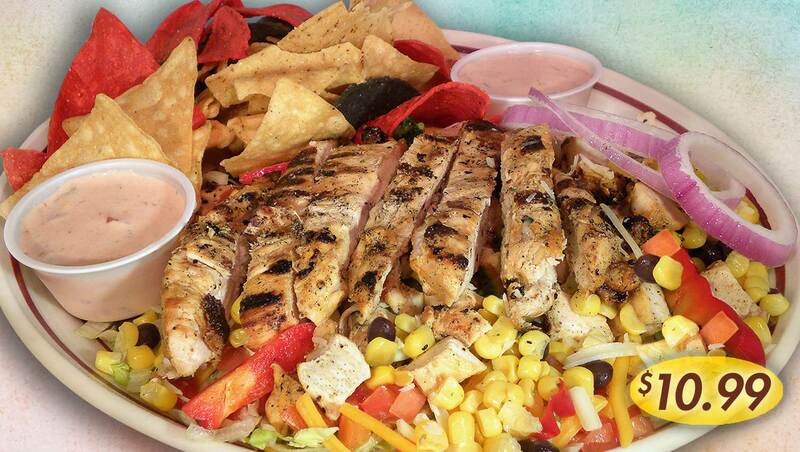 A broiled chicken breast, black beans, red peppers, diced tomatoes, red onions & flame roasted corn topped with cheddar jack cheese over a bed of shredded lettuce… with a few taco chips. … on a bed of lettuce, cheddar jack cheese and tomatoes, with grilled pita. 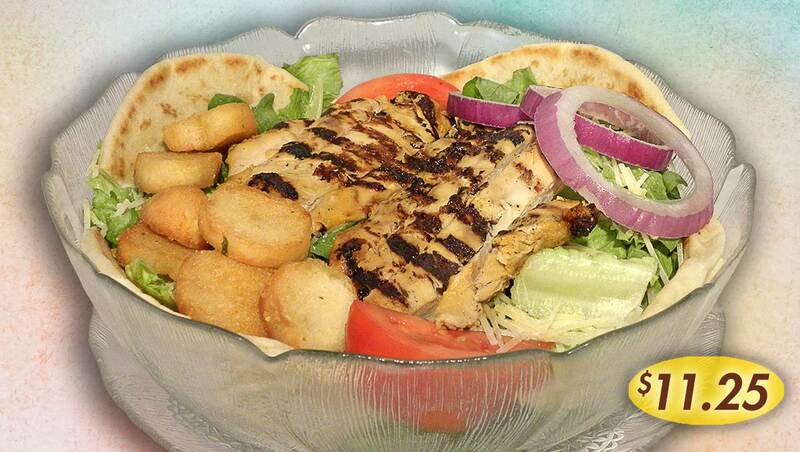 A broiled chicken breast, julienne sliced & served on romaine lettuce (when available) with croutons, onions, tomatoes, Parmesan cheese and Caesar dressing with grilled pita. 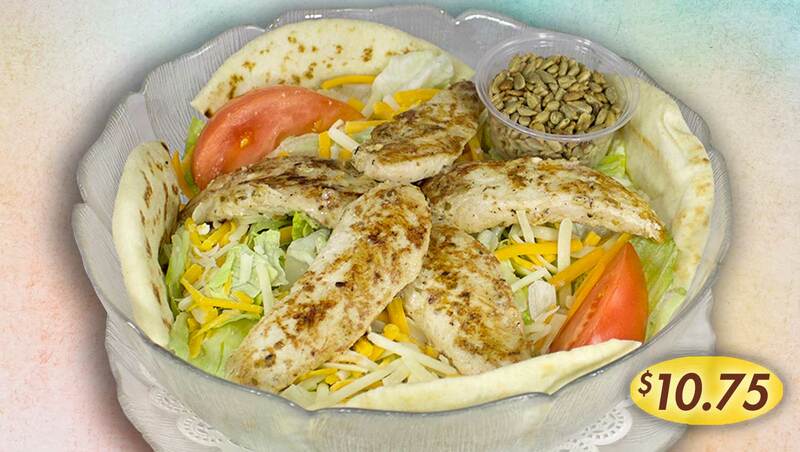 Grilled chicken tenderloins on a generous bed of lettuce, tomatoes, & cheddar jack cheese with grilled pita and sunflower seeds (on the side). 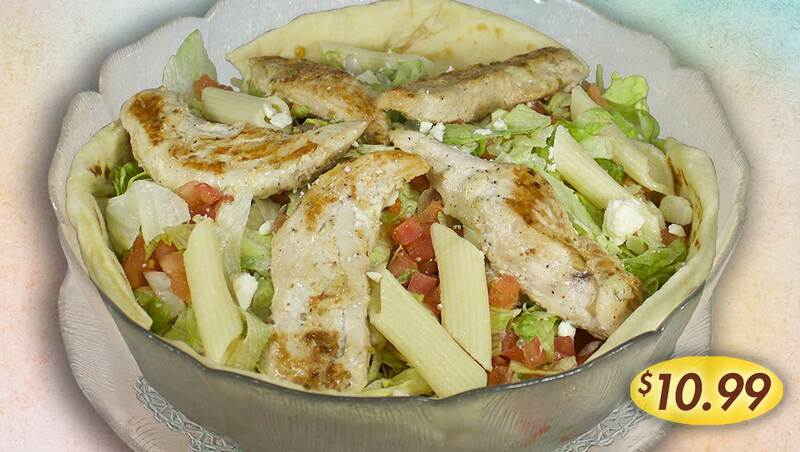 Grilled chicken tenderloins atop Penne Pasta tossed with feta & cheddar cheeses, shredded lettuce, and diced tomatoes. 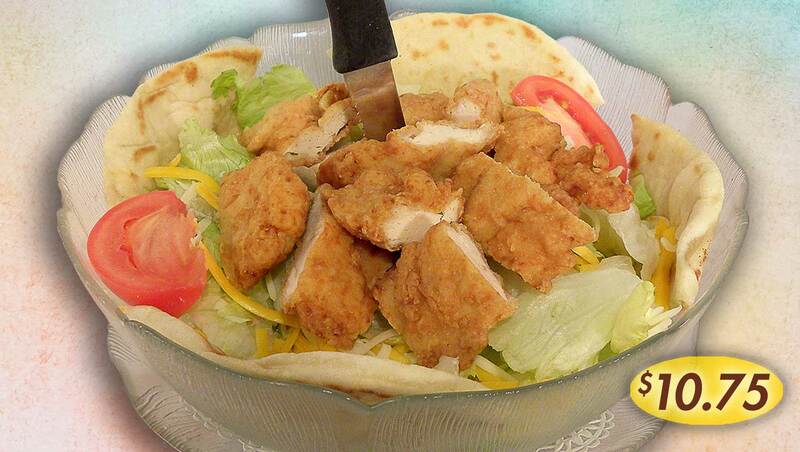 Served with a dressing of your choice and grilled pita. 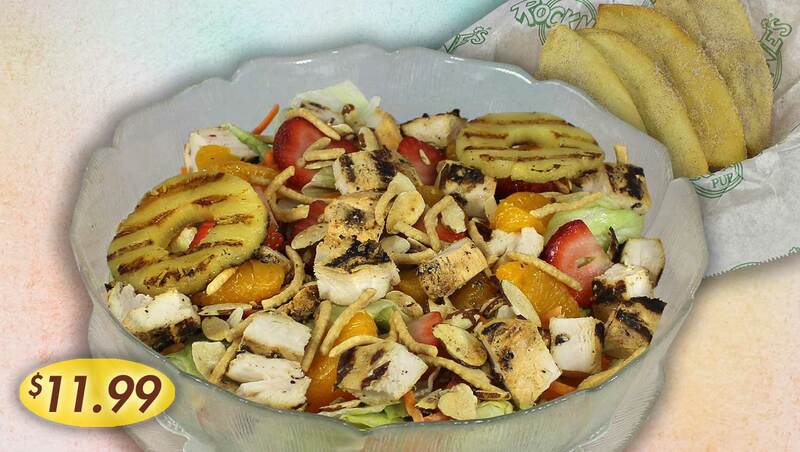 A broiled chicken breast over a bed of lettuce with mandarin oranges, grilled pineapple, carrots, strawberries, glazed almond slivers & rice noodles… with a side of Sesame Oriental dressing. 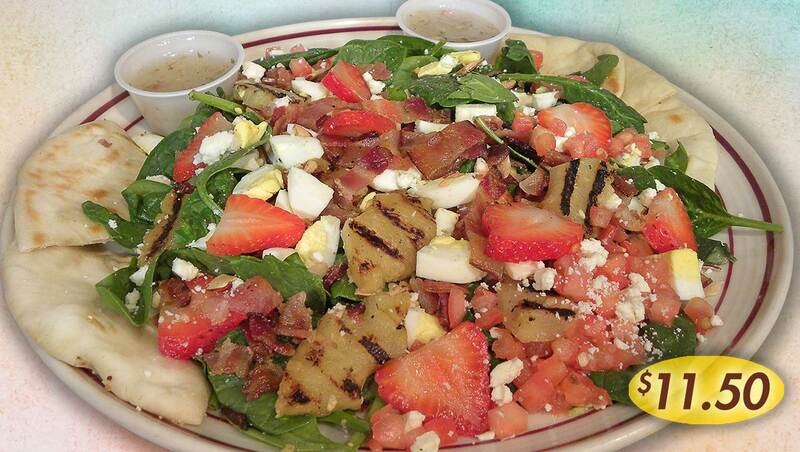 Almond slivers, tomatoes, eggs, bacon, pineapple and feta cheese over baby spinach… with grilled pita & dressing of your choice and topped with a few strawberries slices. 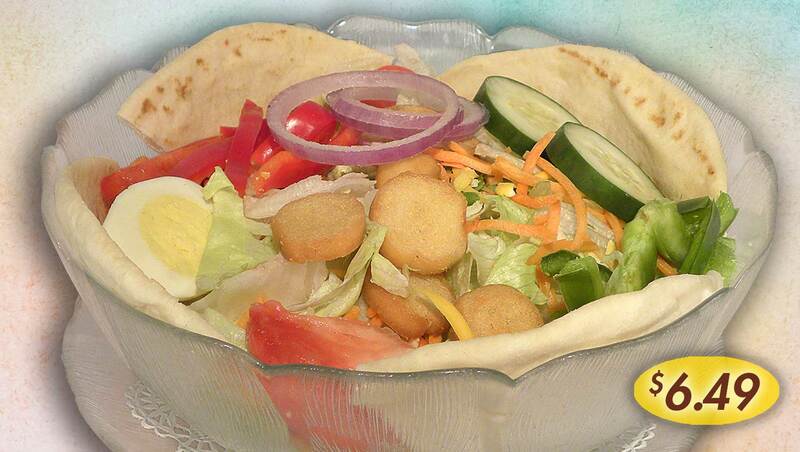 A generous portion of mixed garden veggies and an egg half with shredded cheddar jack cheese, croutons & grilled pita. 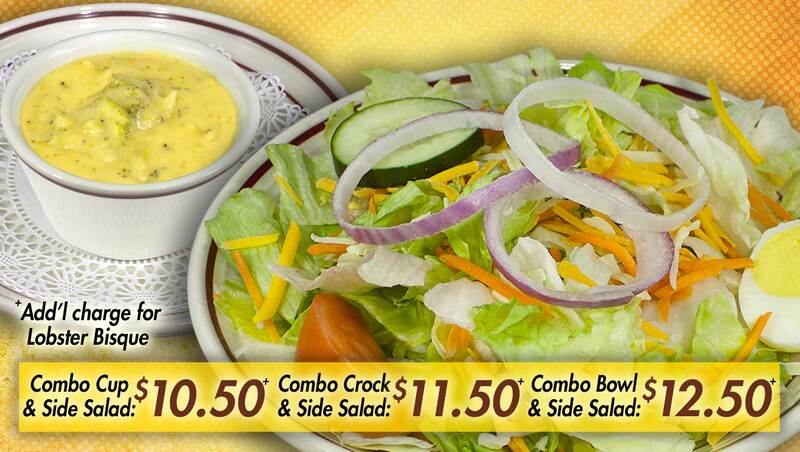 Like shredded lettuce… just ask! Under 10 grams net carbs when ordered with hardboiled egg, instead of pita, croutons or fries.